Spartina patens.Arthur HainesCopyright © 2015.New England Wild Flower Society.gobotany.newenglandwild.org (Accessed 8/2015). Spartina patens is a perennial C4 grass (Day et al. 2001) 30 cm to 1 m tall, densely colonial from slender rhizomes, new growth arising from matted plants of previous season, stems fine, wiry. Leaves 4-30 cm long, 0.1-0.4 cm wide, inrolled; tawny to reddish in winter. Flowers dry, papery; spikelets 0.9-1.3 cm, closely overlapping along one side of spike; inflorescence purplish, spikes 2-7, 1.5-5 cm long, spreading, not appressed to inflorescence axis; blooming and fruiting July-Oct. (Hough 1983). Fruit dry 1-seeded. Seeds eaten by songbirds and water fowl (Martin et al. 1951). 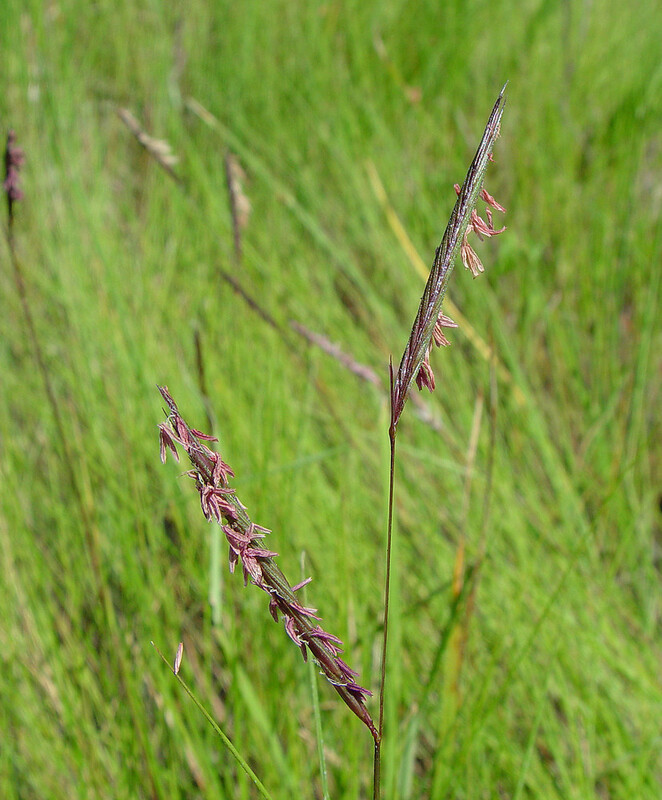 Spartina patens.Marilee Lovit.Copyright © 2015 Marilee Lovit.New England Wild Flower Society.gobotany.newenglandwild.org (Accessed 8/2015). Habitat: Common in high salt marsh, above mean high tide. Forms a flattened, lawn-like expanses of salt meadow. Sometimes found in upper borders of salt marsh or narrow beaches above high tide line, where it tends to grow more erect and robust (Gargiullo personal observation). Very often mixed with Distichlis spicata, which is gray-green, has wider leaves that are ranked along the stem and a tan inflorescence. 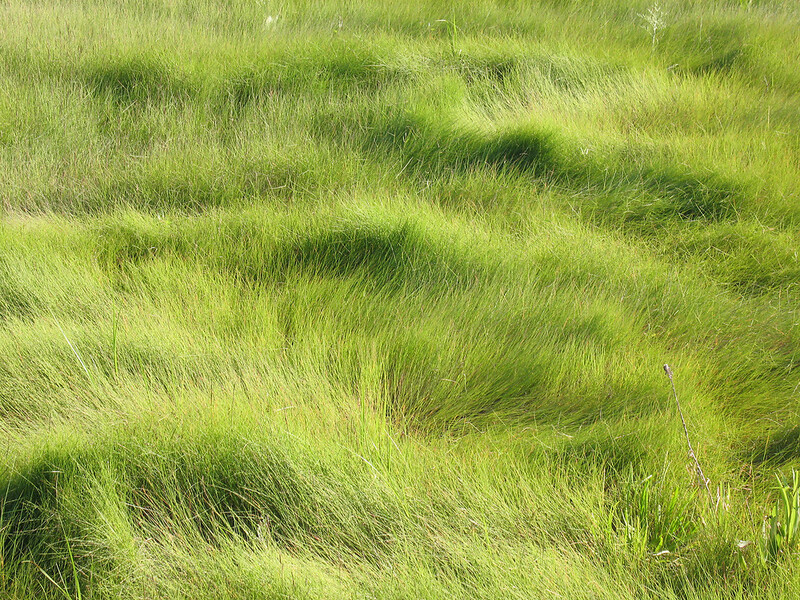 Notes: Salt marshes are important buffers against storms (see S. alterniflora). Plants eaten by Canada geese (Martin et al. 1951). Dominant plant of high marsh, mean high water to mean high high water (spring tide) and above. Soil pH 4-8. Tolerant of drought and salt; brackish to ocean water 35ppt salt. Intolerant of shade. Spartina patens.meadow.Marilee Lovit.New England Wild Flower Society.gobotany.newenglandwild.org. (Accessed 5/2014).